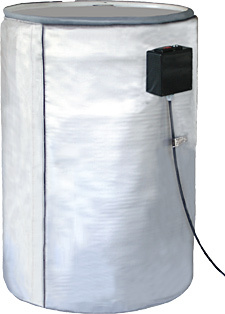 The FCDH Series consists of full-coverage insulated drum heaters that provide a safe and efficient method of temperature and viscosity control. An easy-to-use digital temperature controller prevents temperature runaway. These heaters use a patented grounded heating element and are designed for indoor use when it is desirable to insulate the entire surface of the drum. 6' wide strip that expands heater to fit up to a 24.2' diameter drum. Strip is necessary for heater to fit around drums with removable lids. 참고: All drum heaters are for 55 gallon size and comes with a digital temperature controller. The 120 Vac models include a 3-prong plug, and the 240 Vac models have stripped leads. For "Rolling Drums" with removable tops the standard full coverage drum heater may not completely wrap around the drum. For these drums with diameters larger than the standard 22.6" an expander strip may be purchased.